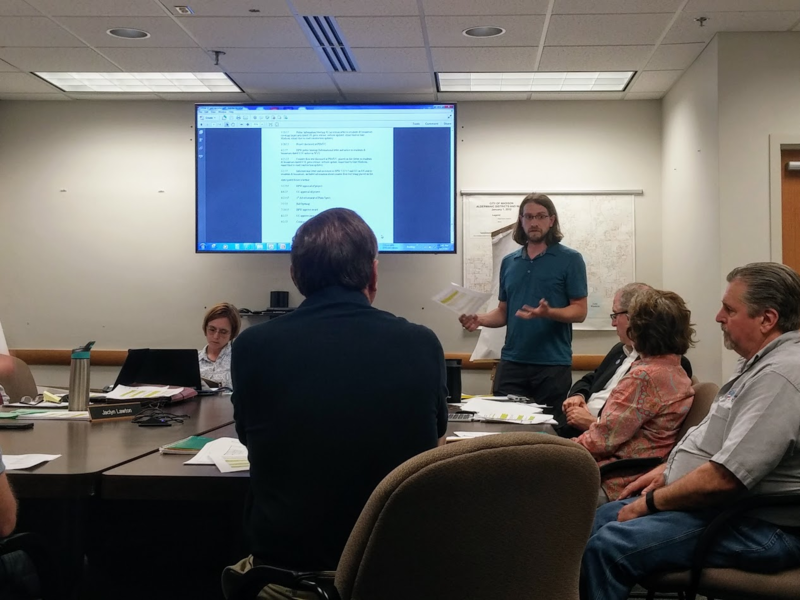 The West Wilson Street reconstruction and the question whether the street should be reconstructed as-is or include safe and comfortable accommodations for people biking was discussed at the Board of Public Works (BPW) last Wednesday. The proposal by City Engineering and supported by the district's Alder Mike Verveer argued for the former, but at the meeting many voices disagreed. Looking beyond the West Wilson project itself, the BPW meeting perfectly demonstrated why Madison needs a Director of Transportation, someone who would be the liaison between the often-competing interests and desires of various interest groups and the city staff who are charged with maintaining and rebuilding our streets. Alder Mike Verveer, in whose district the W. Wilson reconstruction project is located, said that he felt "whiplash" by the requests for protected bike lanes, constituents who fear losing on-street parking, other alders – including two on the Pedestrian/Bicycle/Motor Vehicle Commission -- who requested that the PBMVC needed to see the project again, and city staff who had already sent a letter to adjacent property owners saying there would be neither a pilot test of the protected bike lane that had previously been proposed. Verveer also claimed that this project was being used to fight a turf battle between different city committees. However, three Madison Bikes board members and several other bicycle advocates testified or submitted comments to the Board of Public Works on Wednesday evening, saying that the public process has been botched, the street was unsafe for bicyclists, and insisted that the BPW and city staff follow the city's many transportation and sustainability plans that point out the need to provide safe infrastructure for all road users. It was apparent that the BPW felt very uncomfortable with the conflict playing out in front of them. Normally their schedule is filled by nothing more controversial than approving bids for infrastructures and assessments for new sidewalks. Staff from City Engineering insisted that there was no time to send the matter back to the PBMVC and still meet a September deadline to use Tax Incremental Financing for the project. Additional there was the procedural question whether the Board even had the authority to refer the matter to another committee. In the end, the BPW approved the project to be rebuilt exactly as it is now: no bike lanes, no widened sidewalks, and no test of a protected bike lane in place of parking on the south side of the street. But staff claimed that the design would be “flexible,” should anything change in the future. While this may sound disappointing, there was a bright spot: The resolution to go forward with the reconstruction as-is was amended. Alder Denise Demarb introduced a provision that city staff will develop a plan to make the entire length of Wilson St bicycle-friendly all the way from King Street to Broom Street by the time that the construction around the Judge Doyle Square project is completed (expected to sometime between 2020 and 2022). We will continue to push for a safe, comfortable design on West (and East) Wilson Street that will give space for people biking and walking and support the oft-stated goal of the city to encourage bicycling, walking, and transit use. And we will continue to push for a better public process so that these issues can be resolved and all interested parties can be involved long before a financial deadline is looming. The Pedestrian/Bicycle/Motor Vehicle Commission will discuss the matter at their meeting tomorrow, and the project will be before the Common Council at their June 6 meeting. We will keep you updated for when your input is going to be most effective. Thanks to everyone who testified or submitted written comments: They really made a difference.